Here is a blog post from the archives that is well worth revisiting. The Boston Square to the right is a great way to split up the activities of KM, by looking at Pull vs Push, and Tacit vs Explicit knowledge (or to be more accurate, uncodified vs codified knowledge). 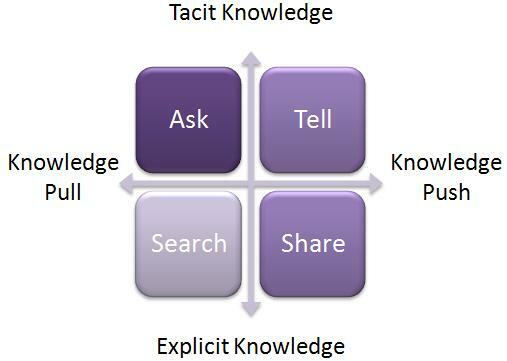 The four segments - Asking, Telling, Searching and Sharing/Publishing - can each be associated with a KM archtype, and I am sure we all know at least one of these! Eddie works to the Publishing House model, concerned with explicit push. To Eddie, success is a knowledge base full of material. He is happiest when people are producing content, and his biggest worry is an empty Intranet. He lies awake at night thinking "How can I incentivise people to contribute to the wiki, the knowledge base, the best practice library". Eddie has a Knowledge Management Cycle on his wall, and the first step on the cycle is "Capture". If only people would capture more material, Eddie would be happy. But they don't, and he is a worried man. Connie works in the "explicit pull" sector of the Boston Square. She believes that the knowledge is documented and in the system, and what we need to be able to do is find it more easily. Connie is investigating better search engines, and has a massive internal debate going on at the moment over taxonomies and ontologies. "Which would be best for my readers" she sighs, as she sips her latte. "If only they would tag better, then we could develop emergent folksonomies". Connie's wallchart is a high level taxonomy that she would dearly love to apply to the company SharePoint, which she knows at the moment is a complete mess, and people are unable to find what they need. Connie is an organised soul, and this mess is something she finds hard to bear. Meet Gabby the Story Circle Man. Gabby loves mess, and loves telling stories (tacit push). Gabby is never happier than sat in a pub somewhere, hosting a company storytelling circle. Gabby believes in the healing power of stories, and in the power of stories to change cultures as well as to carry knowledge. "If only we were better at storytelling in this organisation" he says (to anyone who will listen); "then our knowledge would flow without stopping". Gabby has an aboriginal painting on his wall, painted personally for him by a Storyteller. He wishes everyone would share their story. However lots of people are too busy doing their job to listen to Gabby, and he does tend to talk rather a lot. Tweet is one of the world's natural networkers. She loves everyone, and everyone loves her, because she likes to help. If you have problem, go to Tweet, and although she won't know the answer, she will put you in touch with someone who does. She is a one-woman help desk - all questions find an answer through Tweet (tacit pull). Tweet lives on her smart phone, juggling twitter, yammer, Facebook and Linked-In. She wishes everyone would be always online, just like her. "If only we could give everyone a smartphone" she dreams; "we would be like one big connected happy family, sharing knowledge whenever asked". It puzzles her when people say they can't see the value in tweeting - to her it would be like not seeing the value in breathing. There are other KM archetypes, but these are the four end-members of the Push/Pull, Tacit/Explicit breakdown.